In this screwball comedy, we’re introduced to four different people who have one thing in common: the same overnight bag. 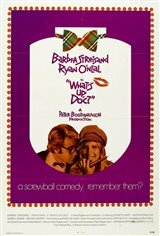 Musicologist Howard Bannister (Ryan O'Neal) and his fiancée Eunice (Madeline Kahn) go to San Francisco and stay at a hotel, where bad-luck Judy (Barbra Streisand) is also staying. Confusion ensues when the identical bags are switched and the owners start to discover that their things have been misplaced. Meanwhile, Judy purses an engaged Howard, and her bad luck starts to take a turn for the better when they go on an unannounced adventure through the city.